TAKE5 gives you an update on the latest Meetings, Incentives and Business Travel related news. It contains short and to the point information on venues, people, happenings, lifestyle and general news that cannot wait to be told! BBT Online guarantees you 15 new ideas in just 3 minutes. Enjoy our 63rd edition. All of our take5 articles are advertorial free. 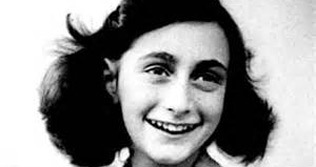 The diary of Anne Frank is one of the most touching and heart-breaking documents of our recent past. It’s a history not to be forgotten. That’s why the Anne Frank House came up with an international traveling exhibition telling the tale of Anne Frank in its historical context. During the tour, visitors are urged to question the processes leading to the holocaust and to think about the importance of the past in our current lives. You can visit the exhibition from 10 May to 30 November in the Wellington Museum in Waterloo. Recently, Ouwehands Dierenpark Rhenen (near Utrecht – The Netherlands) opened its newest attraction. Gorilla Adventure is a unique project housing six male gorillas, separated from the public by a massive gorge. 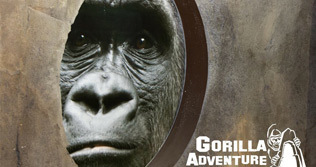 Right in the middle of this spectacle of gorilla madness, you’ll find a new event location. It’s suitable for product presentations, cocktail parties and meetings. There’s a direct view on the gorillas from the venue. Try not to spook them with your pie charts, they might get hungry. If you like cruises you will love this. 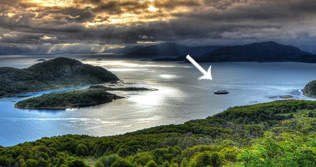 Cruceros Australis sails to some of the most beautiful and untouched places on earth: Patagonia and Tierra del Fuego. Sail through the Strait of Magellan and Beagle Channel, and enjoy one of the most memorable journeys of your life! 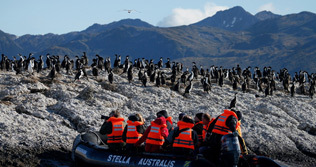 Click on the link if you want to take a look at all possible itineraries: www.australis.com/site/en-us/. Cruceros Australis will be one of the exhibitors at our next speed-date workshop on August, 26. ‘Doing something for charity.’ Amex’s Wendy Beyaert and nine other women take the expression to a whole new level. They fixed themselves a bike and decided to ride from Ghent to Barcelona in only 16 days – 1,750 km all in all. By doing this, each of them is collecting at least € 2,500 to benefit Think-Pink, an organization trying to beat breast cancer. If you want to support these brave and sporty girls, click here to take a look at their Facebook page. 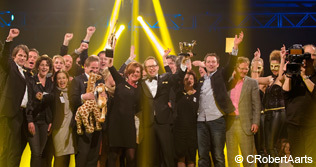 Last April, the yearly Dutch Golden Giraffe award, for those who stick there neck out in the MICE business, where presented in Zaandam. One Live Communication Award 2013 went to eventhouse Dechesne & Boertje in the category Creative, to Mood Concepts in the category Effective (means high ROI) and the giraffe statue for Congress was handed out to NextNovelty Business Events. The Lion Sands Sabi Sand Reserve in South Africa is already quite spectacular by itself. It’s one of the country’s best safari spots, guaranteeing various close encounters with Africa’s most thrilling wildlife. 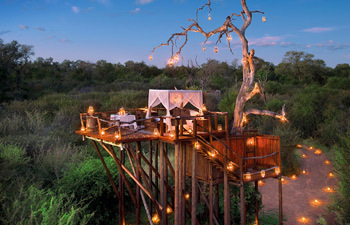 For an even more intimate experience, stay at the reserve’s Chalkey Treehouse, on a wooden platform in a centuries old tree. After you’re dropped here just before dusk (enjoying drinks and a lavish picnic), the only contact you have with the lodge is via radio. You’ll get picked up again in the morning, assuming of course the hyenas didn’t get you. The ultimate Out of Africa experience! Wish we were here too! 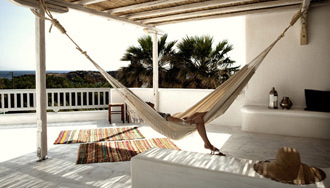 Mykonos, Greece, is known for its white washed houses, long sandy beaches and wild summer night parties. Thanks to a successful collaboration between Design Hotels, Thomas Heyne and Mario Hertel - the creative minds behind Mykonos’ infamous Paradise Club, those looking for a unique experience now have another reason to visit the island. What started out in May 2012 as a six-month hospitality experiment is now here to stay: San Giorgio Mikonos! The hotel will reopen in May for its second season. New this summer: a fresh restaurant concept and a shuttle service plus VIP entrance to the Paradise Club. Rates from 150 euro on. Fun in the water without getting wet? What sorcery is this!? Still, it’s possible. Now you can walk on water like Jesus, assuming of course he did so while in a giant plastic ball. Run, tumble and roll as much as you like and let your inner child out! 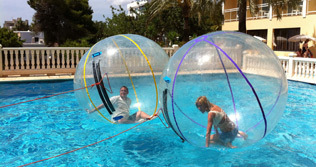 Aquaball fun is not expensive: only € 9,00 per person for ten minutes. Bounce away! Are you a fan of saunas? Would you like to enjoy them without the horrific risk of having a 95-year old grandfather without a towel join in on the fun? Now you can order a moveable sauna to be put up in your own, trusted environment: in your garden, on your terrace, on your company’s parking lot – the choice is yours. Ordering a sauna will cost you € 175 for a day. 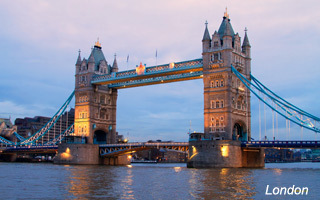 Join BBT Online as a Hosted Buyer to The Netherlands, London and Bangkok! BBT Online would like to invite interested Meeting and Incentive planners to join us on several famtrips or trade fairs. First of all, Rotterdam & The Hague Marketing invite you to a three day famtrip to two of the Netherlands’ most exciting cities! 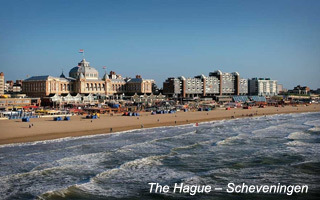 From 20 to 22 June, you can discover the newest and most interesting venues in both Rotterdam and The Hague! Secondly, as the only media partner for the Benelux, BBT Online can take 10 hosted buyers to Meetings Show UK in London on 9-11 July. Last but not least, BBT will attend IT&CM Asia in Bangkok from 1 to 3 October. If interested, you can also join us as a fully sponsored Hosted Buyer. To register yourself or to receive more info, send us a mail at info@bbtonline.eu. Last month, our BBT Online correspondent joined more than 40 meeting planners and incentive agents for an interesting famtrip to Friesland – The Netherlands most peaceful and beautiful province. Meeting and event planners could pick one out of three different programs. Jonathan Ramael took off to the sparsely populated Frisian Island of Vlieland. Click the link to read the full report. 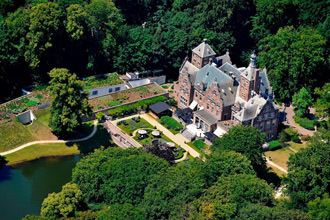 Just a few minutes from Amsterdam, hidden between century-old trees and surrounded by water, lies the marvellous Duin & Kruidberg estate. 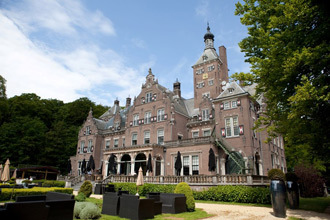 Built more than 100 years ago, this mansion welcomes you with style, class and hospitality. The complex offers 75 luxurious rooms, five beautiful antique halls for banquets and events (150 pax), ten meeting rooms and the possibility to meet outside, and a Michelin-starred restaurant. On Monday, 22 April, the Top Belgian Incentive and Event Agents gathered in The Egg in Brussels, for another successful edition of BBT Online’s Four Destinations Workshop. Great guests (suppliers and planners), great venue and some original entertainment: that’s all we need for an event to be proud of. You can check all the pictures on our Facebook page. Save-the-date: Our second Speed Date Workshop on Monday 26 August in Brussels. The venue and program will be very special, and will be announced shortly. The workshop will take place from 4.00 to 8.00 pm, followed by a dinner till approx 10.30 pm. Note that the event is meant for professional Benelux Incentive and Event agents and PCO’s only. Registration is already possible via info@bbtonline.eu. • Antwerp boasts a good number of culinary events this summer. 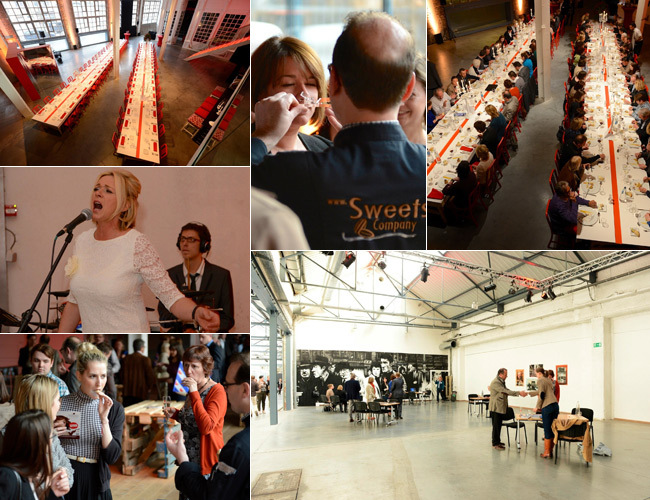 Antwerpen Proeft is the first of three: the 7th edition of this taste festival takes place in Waagnatie from 9 to 12 May. From 28 to 30 June, beer lovers can rejoice during the Beer Passion Weekend on the Groenplaats. Het Bollekesfeest, named after the city’s most famous beer, takes place from 15 to 18 August in the city centre. • 15-16 May, Brussels: European Association Summit. This year’s theme: ‘New horizons, fresh ideas: taking associations to the next level.’ An event no one working in the world of associations should miss. • 6-9 June, Kuala Lumpur, Malaysia: WITM-MITE 2013. An event designed to promote and further develop the Malaysian travel industry, providing opportunities for both general consumers and corporate buyers. With 25 million visitors arriving in the country last year, the industry is booming, with even better numbers expected this year. www.witm-mite2013.com. • 24-28 August, Istanbul: ECM Summer School. The city that bridges East and West always thrived on ideas and new knowledge. This year it will continue to do so, as it will inspire at least 50 new students attending the ECM Summer School, giving them a kick-start to a successful career in the meetings industry. www.europeancitiesmarketing.com. 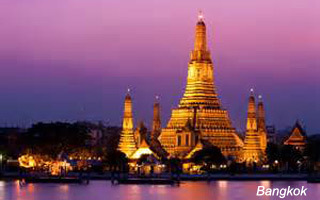 • 1-3 October, Bangkok, Thailand: IT&CM Asia. Hosted buyer registration for this major Asian MICE and corporate travel event is now open. www.itcma.com. • The EMEA Brussels based agency Swantegy, managed by Eric Rozenberg, opened offices in Boynton Beach (close to Miami) and Chicago in order to serve the needs of US organizations operating abroad. www.swantegy.com. • More than 40% of small businesses organise events. 71% of companies agree that the organization of events is an important factor of success. Oddly, only 3% of businesses use the services of an external event planner. • Tour & Taxis has its own spa, complete with sauna, hammam, sunbeds and massage rooms. Tried and Tested by BBT Online. We can absolutely recommend it www.lovinaspa.be. • The European Travel Commission invites young filmmakers to submit their idea for a short film capturing the idea of ‘Europe – A never-ending journey’. The winner will have the opportunity to travel through Europe to turn the idea in to a three-minute short film which will be distributed worldwide. • On the 15th edition of the BEA Awards (Benelux Event Awards) in Brussels Expo, some of the best event campaigns organised in Belgium during the past year were awarded with gold, silver or bronze BEAs. In total, 48 projects were selected to compete for the prizes. Two received a golden BEA: the Samsonite Pan European Event 2012 organised by MeetMarcel, and Come a Casa in Ristorante Del Grano by Fast Forward Events. • Ghent’s new Meeting and Incentive guide was just published. You can download the pdf-file here: click here. • Carlson Wagonlit Travel published a report on the impact of stress on the business traveller. A nice intro to the research can be checked on Youtube here: http://www.youtube.com/watch?feature=player_embedded&v=dNYMp-Gt4vs. • The Roca brothers have claimed the number one spot on The World’s 50 Best Restaurants list. El Celler de Can Roca in Girona has long been hailed as one of Spain’s most exciting places to eat and having spent two years at no.2 on the list, it has swapped places with Denmark’s Noma, which held the top ranking for the last three years. • Rotterdam gets a new landmark located on the inner harbour: Mainport, Design Hotels’ first member hotel in Europe’s largest port city. 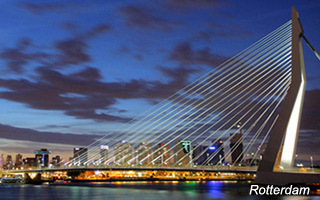 Wide glass windows wrap around the 215-room waterfront building, allowing guests to see and feel the vibrancy of the harbour and the famous cable-stayed Erasmus Bridge. 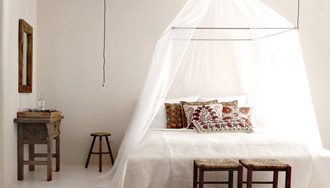 www.designhotels.com/mainport. • The Golden Tulip Hotel de Medici, another venue in Bruges, completely restyled 46 rooms. In barely a month, almost half of the 102 rooms and all the main corridors got a total make-over. www.goldentulipdemedici.be. • Celebrating its tenth birthday, Novotel Mechelen got a complete renovation. The 122 rooms, the public spaces, the restaurant, the bar and the meeting rooms were fully renewed. The hotel can now offer the newest Novotel room concept and five ultra-modern meeting rooms. • After a world tour accompanied by the best chefs on the planet, Dinner in the Sky takes over the sky of Mont des Arts, with a direct view on one of Belgium’s most beautiful spots: the Brussels' Grand Place. 22 guests and 1 chef at a time will share an unforgettable gastronomic experience in the skies over the capital. 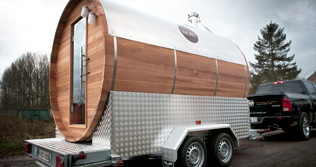 www.dinnerinthesky.com. • After a three year renovation, Sofitel Legend Cartagena Santa Clara opened to the public as the 4th member of the exclusive Legend Hotels collection. This wonderful 400 year old former cloister in Colombia is located in the heart of Cartagena, looking out over the Caribbean Sea. • Restaurant day (Brussels, 18 May) is a new international concept based on sharing and meeting each other in the context of gastronomy. Participants will get the chance to run their own eating/drinking venue for a day. 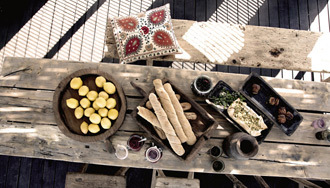 At home, at work or with friends; a juice bar, a cookie factory or a six-course meal: everything is possible. This festival started spontaneously in the streets of Helsinki, where it is now organized every season. Today it’s an international happening in almost 20 countries. All participants are mentioned on the same website. Want to join or check the list? Go to www.restaurantday.org. • Manuel Butler, GM of Tourspain, was elected President of the European Travel Commission (ETC) on 11th April. He succeeds Petra Hedorfer of the German National Tourist Board (GNTB) for a three-year term. Also elected at the meeting were Gergely Horvath (Hungarian National Tourist Office] and Marios Hannides (Cyprus Tourism Organisation) as the organisation’s Vice Presidents. • Rocco Forte Hotels appointed Philippe Spagnol as the new GM of Hotel Amigo in Brussels. Hotel Amigo boasts 174 five star rooms in the heart of the capital, close to major landmarks like the Grand Place. • On 24 April, Bowling Stones Wemmel said goodbye to its GM Gunter Gys. Michel Troch (Sales, Marketing & Events Manager) will replace him for now, until further decisions are made. • Mr. Event is a knight! On Holland's biggest event Queensday, Arjan van Dijk, company founder of the Arjan van Dijk Group, was appointed as knight. Not for events, but because of his big involvement and commitment to society. • Members of the Aviation Press Club (APC) chose Geert Sciot as their Man of the Year 2012. Sciot has been Vice-President Media Relations and thus spokesman for both SN Brussels Airlines and Brussels Airlines since 2002. He also works for the Association of European Airlines, as GM Communications. If you’re interested in joining yourself, don’t hesitate any longer. You will find the conditions and the existing members behind this link www.bbtonline.eu/club100.php. Membership is linked to the person, not the company. We also created a LinkedIn group for members only.